One type of stain-caused by traumatic injuries, medications and fluorosis-actually begins inside the tooth; brushing and flossing doesn’t help. Another type of stain-one that can be more easily attacked by brushing, flossing and rinsing-is caused by external factors such as foods. The professional whitening procedure performed by our office is considered to be the most effective and safest method; done properly, tooth whitening can last as long as five years. 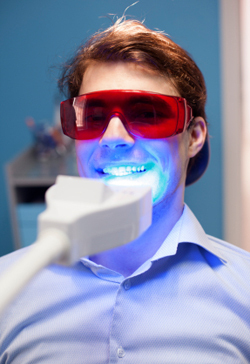 Over-the-counter whitening systems are somewhat effective as long as they are monitored and directions followed closely.